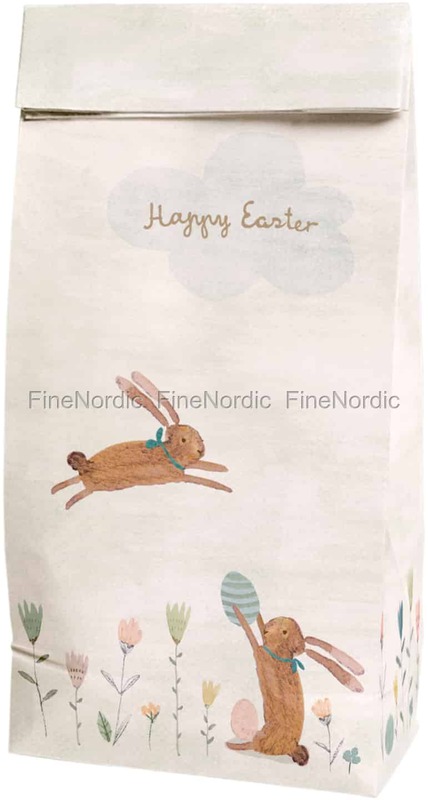 The small Maileg gift bag Happy Field shows two bunnies happily playing in a field of wild flowers. One is practicing his high jumps and the other one holds a striped Easter egg way up high. There is a little cloud floating by in which you can read the words “Happy Easter”. This gift bag is 26.5 cm tall and it’s great for an odd sized gift. Just insert the gift and fold the bag over at the top to close it. You can leave it as it is or add a pretty bow or a ribbon. It’s also convenient to have, when you need to wrap something up in a hurry.